All-new from the top names in mystery and fantasy? 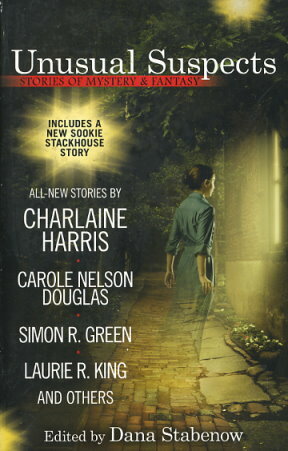 including a never-beforepublished Sookie Stackhouse story from Charlaine Harris! This follow-up to Powers of Detection showcases bestselling and award-winning names from Simon Green to Laurie King to Sharon Shinn?with original stories featuring otherworldly investigators trailing uncanny criminals across fantastical realms. From video game characters seeking civil rights and a cave dragon loan shark pondering an investment, to Santa Claus?s Australian vacation and an enemy of Sam Spade?s out for revenge?plus visits to the Nightside and Sookie Stackhouse?s hometown? these stories will take readers around the world on a magical mystery tour. Lucky is a short story in the Sookie Stackhouse series by popular American author, Charlaine Harris. Sookie and her current houseguest, Amelia Broadway, get a visit from Insurance agent, Greg Aubert. He’s worried that someone has been going through his files. With a combination of spells and psychic talents, Amelia and Sookie find out just who has been in Greg’s office, and quite a bit more besides. A vampire refugee is discovered, and Sookie is tempted by a puppy. A nice little interlude between Sookie instalments.